We at Carbonyte Systems Inc. are dedicated to providing our customers with the best service, materials and equipment at fair and marketable prices while continuing to improve on the current technologies. We are constantly striving to improve the Pavement Maintenance Industry with innovation in design and application. We use the most sophisticated equipment and experienced personnel to develop and expand the latest technologies in and outside the pavement industry. Years ago, the Space Travel industry brought an excitingly innovative and new technology called the “Carbonyte Process™.” As we continue to develop and improve this technology, we continue to look for other technologies and resources that can benefit the pavement industry. 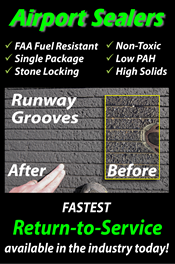 CarbonSeal-FR™ FAA Fuel RESISTANT Sealcoat (ASTM D2939) Finally a "Green" & asphalt compatible coal-tar alternative. Typically used as a mineral filled sealcoat to meet the FAA specification for Fuel Resistance, CarbonSeal-FR can also be made to suit as an un-filled sealer spray-applied through a heated distributor truck. Carbonyte-FP™:(Fuel PROOF) As the newest member of the Aviation Grade sealers, Carbonyte-FP has not only met, but has surpassed the fuel proof standard we expected of this sealer. For a truly Fuel PROOF liquid sealant, Carbonyte-FP protects the pavement below from jet, diesel and gasoline fuels to motor and hydraulic oil spills. Amazingly tough and durable, Carbonyte-FP is the ultimate in pavement protection. With the right pavement profile restoration completed below, Carbonyte-FP as a top coating will protect your pavement so all you will need to finish cleaning up your spill is a towel/absorbent pad. No chemicals or other harmful products to used or exposed to the environment. Carbonyte Type 'S' Sprayable Slurry: Type S slurry seal is a permanent, cost effective, substantially more durable pavement preservation alternative for parking lots and driving lanes. Replaces conventional top coats for all pavement surfaces from freeways to airports. CarbonSeal-HF High Friction Sealcoat: Designed to penetrate deep into pavement substrates where it permanently weather seals airport, street and highway apron surfaces. Product may be applied as a mineral filled sealer through spray, broom, or squeegee apparatus; also, may be applied as an unfilled coating through high volume equipment (distributor truck). Within as little as a few minutes after installation a tough but ductile, black satin surface permanently protects the underlying asphalt surface from tire wear, sun degradation and moisture. Carbonyte-A: (Atomized Slurry/Fog Seal) - Carbonyte version is an SS1-h on steroids! We take hard pen asphalt and infuse a polymer layer for improved stability, penetration, fast cure, water resistance, and achieve a high softening point that will all but eliminate tracking. The elevation in characteristic will at least double the life of standard emulsion coatings. See ARB Microemulsion for even more muscle! Carbonyte-ARB: (Asphalt Rubber Binder) - This Microemulsion Surface Treatment is an 'Asphalt Rubber Binder' in liquid form that unleashes the power of SBS/SBR polymer from a scrap waste tire. Flexible, tough, water resistant, black saturant that fits level 1 pavement preservation. This material may be shot warm or cold through a distributor truck for high volume applications. Carbonyte: (Base Adhesive) - Heated Distributor Truck Applied Fog, Seal Coat & Slurry Seal as a Micro Texture Surface Treatment base on the Pavement Index you would like to achieve. Carbonyte-CS: (Cape Seal) - Typically a slurry over chip seal, Carbonyte developed a spray applied Type 0.5 design to help stabilize stone loss and infill some of the porosity of the chipped surface. The result is a black, well sealed surface that will extend the service life of chip seal, improve ride ability, and leave an aesthetically pleasing look closer to that of standard pavement. Depending on the performance target this product may come with SBS polymer or ARB modified asphalt binder. Carbonyte-PAF: (Parking Area Formula) - Environmentally friendly, and, due to its inherent qualities of asphalt chemistry, is by nature the best sealer treatment to consider for all asphalt surfaces. Several models are available depending on varying pavement conditions and traffic concentration. Carbonyte-Slurry: Type S, Type 1 ISSA, Type II & Type III are all single package Slurry Seals and available specific to your region & need. SkidGuard: (Skid-Resistant Coating) - The Premium Skid-Resistant Coating for Steel, primed concrete & wood. CTM-342 & ASTM C 1028 Certified. Agency Ready & can be ordered in various colors. Standard Black. Street-Tint: (Architectural Coating) - High Visibility, Improved Traction pavement coating which aggressively adheres to various walking and driving surfaces. Can be ordered in various colors. Bridge Deck Treatments: Expansion joints on bridge decks pose a hurdle for contiguous pavement maintenance coating installations as they will not adhere to these metal surfaces. Similar to our SkidGuard coating is a material that can effectively be a priming interlayer to promote adhesion of slurry and other pavement materials. The added benefit is a smoother ride and less transitional vibration into the bridge structure. ARM Slurry™:The Asphalt Rubber Micronized slurry restores durability, waterproofing, UV/IR protection & rideability to your pavement situation. S.A.M.I. - Stress Absorbing Membrane Interlayer: A highly flexible waterproof membrane which can be used alone or prior to another sealer. GatorGuard: The Easy, Fast & Economic Spot Repair for Alligatored Asphalt & Divots. GrimePrime: The Premium High Solids Primer & Sealer to be used over oil & grease spots in preparation for a sealer. Accel-R8: Additive to extend season and hours in day for other asphalt sealcoats which Promotes Fast & Complete sealcoat curing, even in typically colder temperatures. P2GTR - Prime Permutated Granulated Tire Rubber: This process extracts the polymer from the scrap waste tire to be used as the feedstock in dry form to modify HMA or further processed into the Earth Resin liquid rubber. This component is a fraction of the cost of virgin polymers and is better at resisting UV/oxidative hardening, the key to longer lasting pavement! 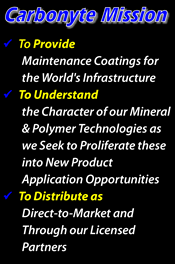 Thank you for your interest and continued business with Carbonyte’s cutting edge products. Please contact us with any questions and we look forward to partnering with you for the success of your business. * Dry times will differ based on various conditions which include sealer mix design, additives, surface and air temperatures, wind, humidity and sun loads.